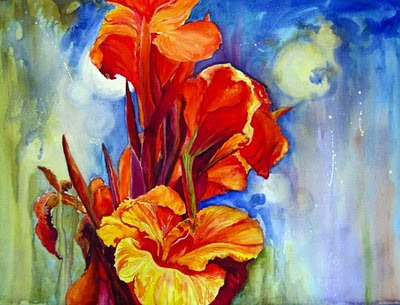 Canna lilies are very common in India so when i saw a photo of this plant on Wetcanvas i had to paint it. The species have large, attractive foliage and horticulturalists have turned it into a large flowered, brash, bright and sometimes gaudy garden plant. It is one of the world's richest sources of starch and is considered an agricultural plant. Thanks Krista, i am so happy to see that u still visit my blog. I love this watercolor! I've been painting flowers lately, and I love how you've captured the structure. Great background too! Thanks Trina, i was not sure about the background at first so thanks for the confirmation. Priti, this is just gorgeous. Your work has always had wonderful color and this one is no exception. I really like this one! Thanks Nancie for visiting and leaving encouragement. Wow Priti, this is fantastic! The color just explodes beautifully! Thank you Len, have not heard from u in a while. Thank you Sam- i was unsure about the background at first but i got a few good reviews on it so i am keeping it. The colors are just so bright. What type of watercolor paints did you use to get such vibrant colors? It is absolutely beautiful. Your work is so wonderful.